My sympathies lie with radical socialism. In particular, I align myself with the radical reformers of the 18th and 19th Century who fought against poverty, injustice and political inequality, which fight, formed the bedrock of even further reforms over the last 150 years that have given us the priviledges and opportunities that we can all enjoy today. Without these reforms, people like me, from a poor, working class background, would be still stuck in a world with no hope, no promise, and no future. We should never lose sight of the achievements of, and costs to, great men and women of the past. Feargus O'Connor was a Chartist leader, and became a Nottingham MP in 1847. Born around 1796, he studied at Trinity College, Dublin, and became a lawyer. He inherited an estate in Cork, and during Irish agitation for reform in the early 1830's, he emerged as an advocate of Irish rights and democratic political reform. He became MP for Cork in 1832 but lost his seat in 1835. He turned his attention to English radicalism and toured the country campaigning for political reform. He was described as "a superb orator, powerful, defiant, humorous". (What would I give to be described as such?). 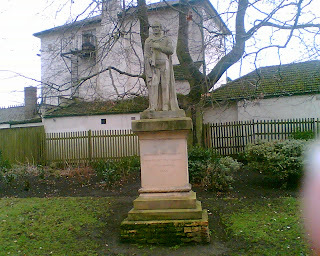 In 1840 he was arrested and imprisoned in York Castle for 15 months. As his behaviour, apparently became increasingly irrational, he was declared insane in 1852, and was sent to an asylum in Chiswick, where he died in 1855. It was reported that 40,000 people attended his funeral. 1. A vote for every man twenty-one years of age, of sound mind, and not undergoing punishment for crime. 2. The secret ballot - to protect the elector in the exercise of his vote. 3. No property qualification for members of Parliament - thus enabling the constituencies to return the man of their choice, be he rich or poor. 5. Equal Constituencies, securing the same amount or representation for the same number of electors, instead of allowing small constituencies to swamp the votes of large ones. 6. Annual parliaments, thus presenting the most effectual check to bribery and intimidation, since though a constituency might be bought once in seven years (even with the ballot), no purse could buy a constituency (under a system of universal suffrage) in each ensuing twelve month; and since members, when elected for a year only, would not be able to defy and betray their constituents as now. ﻿﻿﻿﻿﻿﻿﻿﻿﻿﻿﻿﻿It is of interest to note that these were not new demands. Major John Cartwright, Nottinghamshire born, and a Major in the Nottinghamshire Militia, produced a pamphlet in 1776 called "Take your Choice", which was enlarged and re-published in 1777 under the heading, "Legislative Rights". He was an outspoken campaigner for parliamentary reform. ﻿He fought for the rights of the people, and was a military man with heart and principle. He despised the corrupt proceedings of, and elections to the House of Commons. 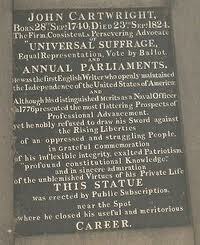 His pamphlet and memorial stone show that he fought for Universal Suffrage, Equal Representation, Vote by Ballot and Annual Parliaments. 1. Annual Parliaments 2. Universal Suffrage 3. Voting by Ballot 4. Equal Polling Districts 5. No Money Qualification of Members 6. Payment of Members for their Attendance. 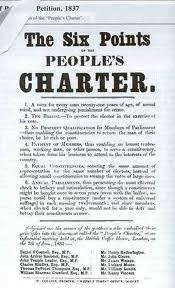 The People's Charter of 1838 was basically the same as that produced by the people of Westminster, 57 years earlier. People were now becoming frustrated at the pace of change. 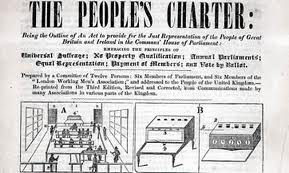 The anger over the 1832 Reform Act, and fury over the new Poor Law which established the workhouse system, found an outlet in Chartism. People were tired of what one letter writer in 1847 described as "do-nothing, kid-glove reformers". It was time for action. Chartism was not an organisation in itself, but was essentially an umbrella movement which drew together many strands of radical grievance, and gave working class people a focus, and a voice. There were two main strands to Chartism. One advocated physical force, while the other argued for moderation. Feargus O'Connor definitely seemed to advocate 'direct action' and the threat of violence to achieve his aims. Perhaps this is why he was so welcome in Nottingham, as the town has a long history of riotous behaviour. A local man said in 1799 that "he had lived 17 years in Nottingham, and during that period there had been 17 riots". However, though there was armed rebellion, strikes and clashes with soldiers, the main weapon of the Chartists was the mass demonstrations and signatures to petitions. Support for Chartism in Nottingham is hardly surprising, and in September 1838, James Woodhouse, a local Chartist told a meeting of 2000 loom operators that political reform was "the means by which they could furnish their houses, clothe their backs and educate their children". This is what the poor and disenfranchised people wanted to hear. The first major Chartist meeting held in Nottingham was on the 5th November 1838 at the Forest where 3000 met on "a wet and uncomfortable day". There were further meetings held in Nottingham during 1839, and in July of that year the first national petition was presented to Parliament. It is said that of 1.3 million signatures, 17,000 came from Nottingham. The House of Commons threw out the petition, provoking a wave of unrest across the country. Fergus O'Connor had first spoken in Nottingham in 1836, when he urged radicals to form a party for themselves. The winter of 1841-42 produced harsh economic conditions which fuelled the flames of discontent again, and as a result of this, O'Connor received a "tumultuous welcome" when he came to speak in the town in February 1842. A second petition with over 3 million signatories was presented to Parliament in May 1842 which was yet again rejected. "Three and a half millions have quietly, orderly, soberly, peaceably but firmly asked of their rulers; and their rulers have turned a deaf ear to that protest. Three and a half millions of people have asked permission to detail their wrongs, and enforce their claims for RIGHT, and the 'House' has resolved they should not be heard! Three and a half millions of the slave-class have holden out the olive branch of peace to the enfranchised and privileged classes for a firm and compact union, on the principle of EQUALITY BEFORE THE LAW; and the enfranchised and privileged have refused to enter into a treaty! The same class is to be a slave class still. The mark and brand of inferiority is not to be removed. The assumption of inferiority is still to be maintained. The people are not to be free". [Am I the only one to see echoes of this in Martin Luther King's 'I have a dream' speech?]. There was further national and local unrest that year, culminating in the battle of Mapperley Hills in August, when around 5,000 Chartist supporters assembled. The Riot Act was read, and despite the fact that the people were "quietly sitting down to eat their dinner", troops arrested 400 men, who were handcuffed, tied with ropes and marched four abreast to the House of Correction. Needless to say, this insensitive treatment provoked a riot. Because of his popularity with the people of Nottingham, there was no surprise when he was elected their MP in 1847, but by the early 1850's, Chartism was beginning to decline. So, did Feargus O'Connor and the other Chartists fail? Certainly most of them did not see the People's Charter reforms happen in their lifetime, but all except one of the six points in the Charter is now law - the one exception being the call for annual parliaments. Who knows where we would be today if it had not been for the Charter Movement. 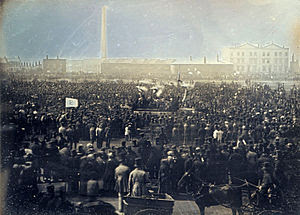 Chartism is important because it gave birth to the first ever mass working class political party; it created a political culture that endured for decades, and it paved the way, in terms of ideas and the training it gave to young working class radicals, for the ultimately successful campaigns for a universal right to vote. Chartism created a long-term political culture in which later left-wing ideas flourished. I for one salute those radical reformers (whose names are too numerous to mention), and in particular Feargus O'Connor, who fought long and hard for those privileges that we so enjoy today. Let's not ever forget them.